I've been writing in iWriter for several years now so it's really disconcerting what's currently happening to the freelance writing site. I'm hoping that this really is a one-time glitch in the system. In the years that I've written for the site, I've never experienced a delay this long. My payment method on iWriter is set every Tuesday. This means that as long as I reached the $20 threshold, my earnings should already be in my PayPal account either on Wednesday or Thursday. And this was always the case with iWriter. So I'm surprised that it's been two days already but the money is yet to be sent on my PayPal account. I sent a support ticket to iWriter and they responded via email but it looks like a pre-written response message that's automatically sent by an automated software as an answer to queries being sent by disgruntled writers. Below is a copy of their response vie email when I sent them a support ticket. "We have spoken with PayPal and just recently they have a reported bug that has caused client's mass payments to not process as expected. They are actively working on the bug and when fixed, the payment will go through automatically. Please allow 24 hours for PayPal to correct this issue. Thank you for your understanding." The email was sent in the name of a certain Amanda Campbell whose job title says "support specialist". Well, I spoke with several other iWriter writers and asked them to send support tickets. All of them received the same response from Ms. Campbell. So yeah, it does look like an automated response. 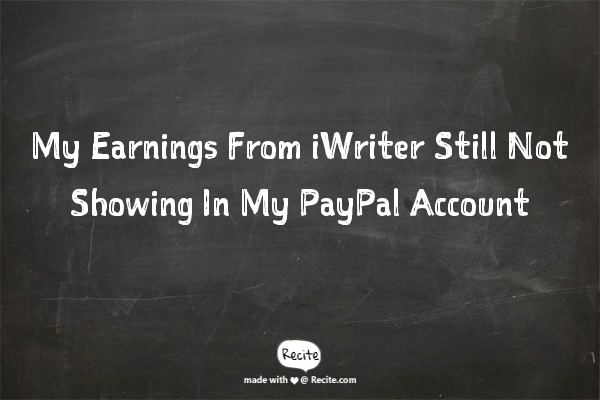 Anyway, what I get from the iWriter response is that the problem lies within PayPal. There is no way to verify this though. They also said that the issue will be resolved within 24 hours. Well, it's been more than 24 hours already and the money is still not reflecting in my PayPal account. I hope they resolve this issue soon. The payment I'm expecting to receive on PayPal isn't much but I worked very hard in earning it. For sure, I deserve to get it on time.